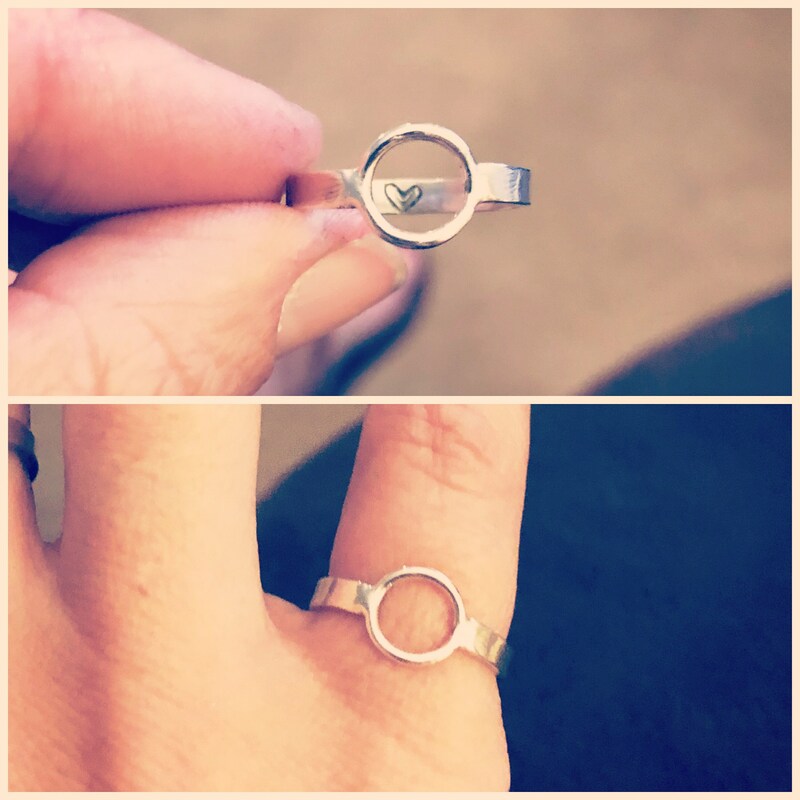 This circle ring has a heart visible through the center of the circle, only visible to the wearer when the ring is taken off, giving it a hidden meaning of love from the buyer or giver of this unique ring. 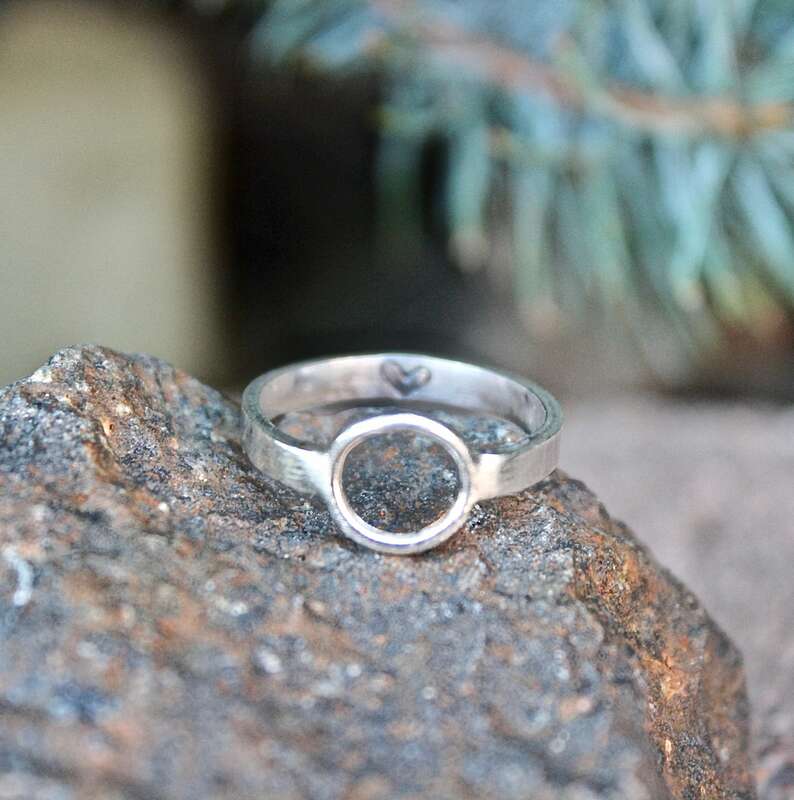 I create each circle ring by hand from start to finish using sterling silver wire to create the circle and solder everything to a sturdy sterling silver ring band. The band width is 2.5 mm. I hand stamp the heart in the center. 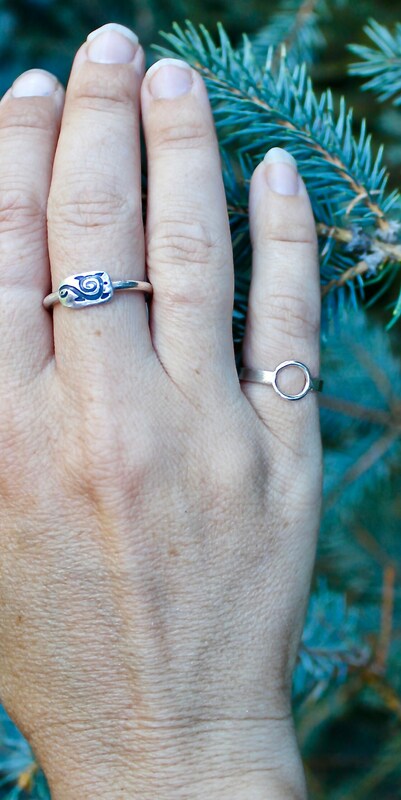 Each ring is created with solid sterling silver, by hand, by me, here in the USA. Because each item is made by hand upon order, please check processing speeds to see how long it will take for your unique item to ship. At the end of the processing speeds, the shipping speeds begin. Check listing details for specific processing and shipping speeds. 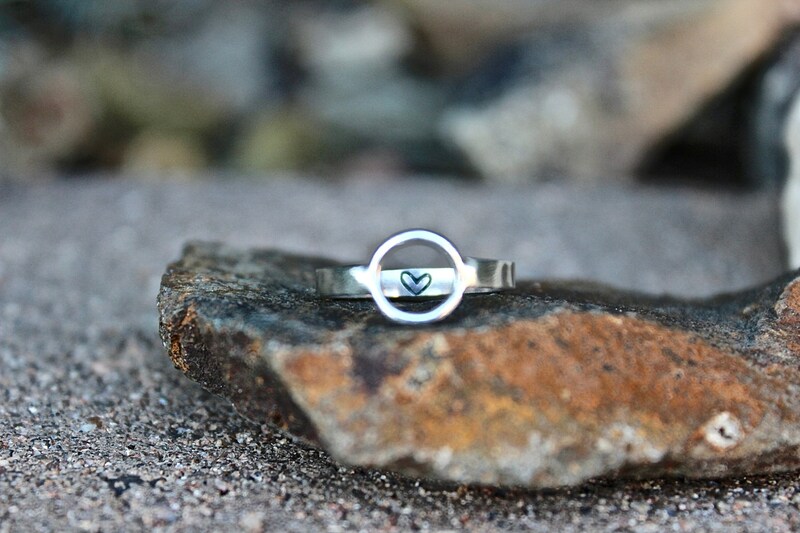 Because my designs are very minimalistic, I don't add the .925 mark to my sterling silver pieces, but I do guarantee the quality and silver content. To fulfill your order, you must provide me with certain information (which you authorized Etsy to provide to me), such as your name, email address, postal address, payment information, and the details of the product that you’re ordering. 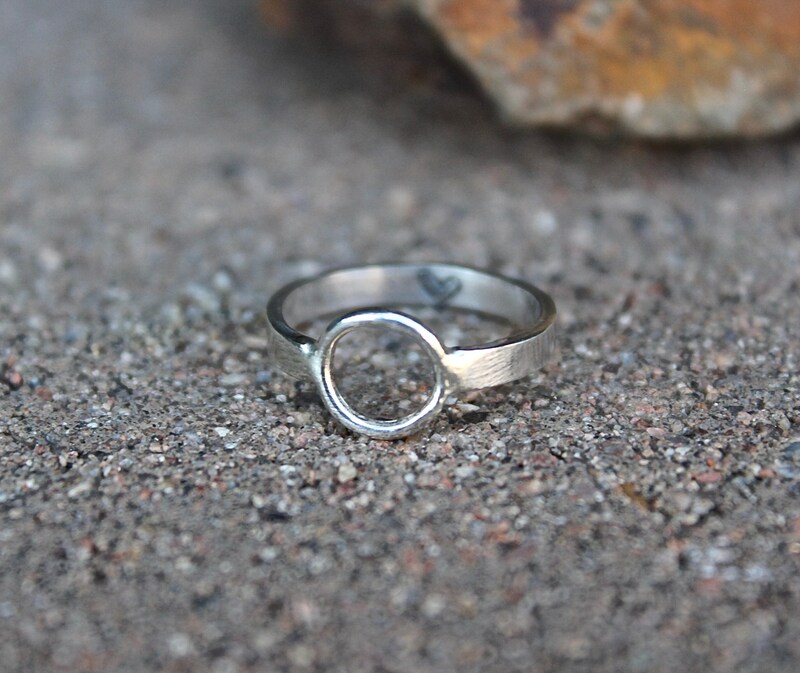 You may also choose to provide me with additional personal information (for a custom order of jewelry, for example), if you contact me directly through Etsy or by email. 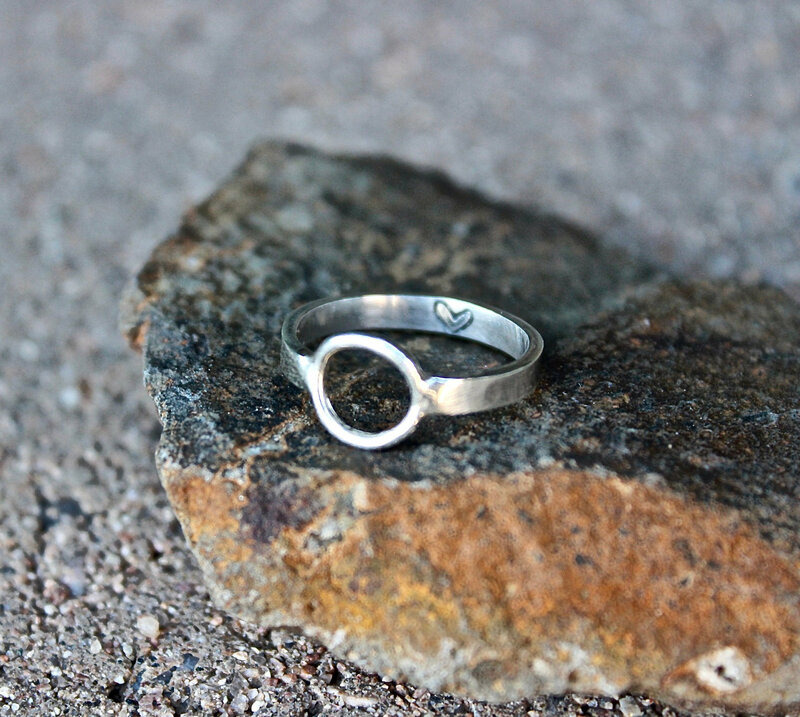 Yes, I am always willing (and eager) to personalize an item for you or create something brand new! Please feel free to contact me here on Etsy or by email: shop@carmellasjewelry.com. If it's between the hours of 7AM and 10PM, I typically respond within minutes. Typically my processing speed is listed on each item. 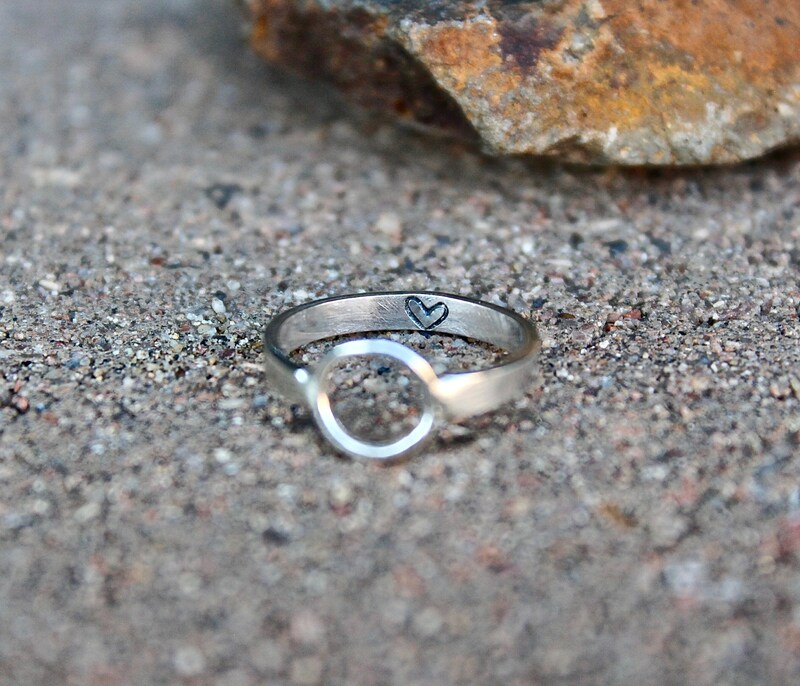 If you want something sooner or hope to receive an item by a specific date, please contact me here on Etsy or by email (shop@carmellasjewelry.com). Usually, if I can make your item quicker, I won't charge an additional rush fee...with the exception of holiday seasons. 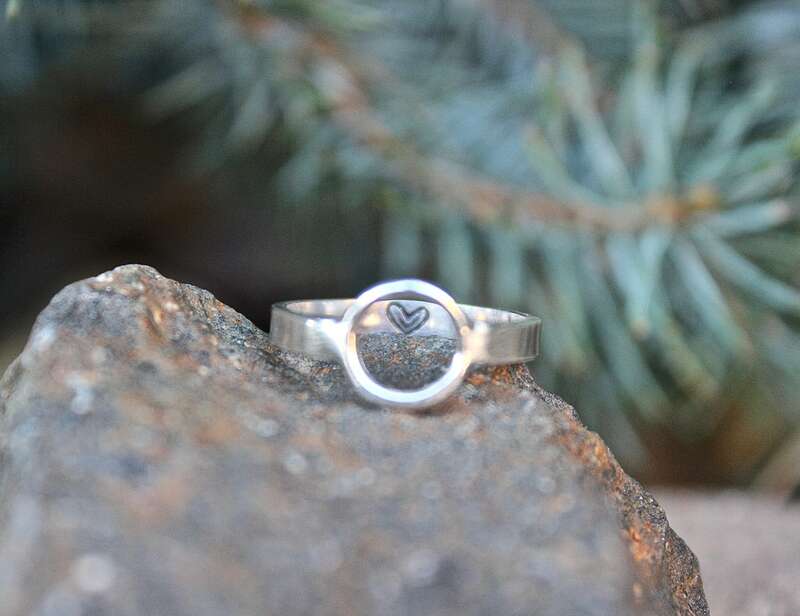 Yes, I do offer wholesale orders, but they are priced and processed on a case by case basis so please contact me with your request either here on Etsy or by email (shop@carmellasjewelry.com). White Copper is a form of metal that combines copper with nickel, creating a sturdy and affordable silver toned metal. This is not plated silver, but silver toned throughout the metal, meaning though it may tarnish slightly, it can be polished back to a brilliant silver shine with an anti-tarnish polishing pad. How can I get you the handwriting, drawing, or print (foot, hand, finger)? Simply take a clear photo of the handwritten message or child's drawing, or foot/hand print. You can do this using an iPhone or Android smartphone. Try to make sure there are no shadows over the image. Then simply attach the photo to a conversation here on Etsy after you place your order. I'll match up your order details with the photo you send. If you want more than one item for fingerprint items, I usually offer a discounted price. Just reach out to me before placing your order either here on Etsy or by email (shop@carmellasjewelry.com). If you want a large order of aluminum items (more than 5), I offer a discount as well, please contact me before placing your order. Nora Roberts. Because her protagonists are always independent women. They're strong, smart and live mostly perfect lives and her books motivate me to follow my passions. I ship all my orders in sturdy padded envelopes. Each item (regardless whether it's marked as a gift...they're still gifts if you're buying it for yourself!) comes gift-wrapped in either a muslin bag or an organza bag (colors my vary). 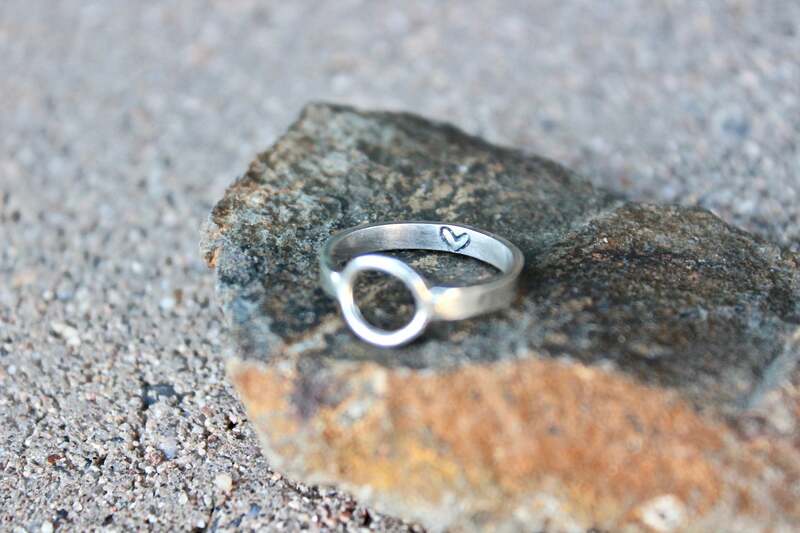 I handstamp all the items in my shop that are created with aluminum metal. 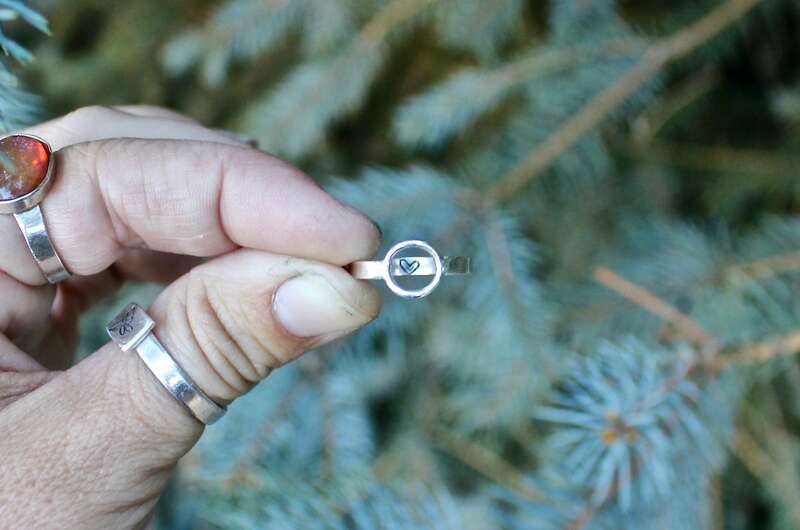 Aluminum is unique in that it won't ever change color or tarnish, which is great for longterm wear, but makes it difficult to find a permanent jewelers ink to darken the letters and designs that are handstamped into the ring, necklace or bracelet. I use a permanent jewelers ink to create the blackened effect on all the rings, bracelets, and necklaces, but I advise you to refrain from wearing the piece while swimming, bathing, or peeling oranges (for real). If you do see the black permanent jewelers ink fading, you can reapply using a black permanent marker. Wipe away any excess with a tissue. The jewelers ink I apply originally is the Onyx color created by Vintaj.